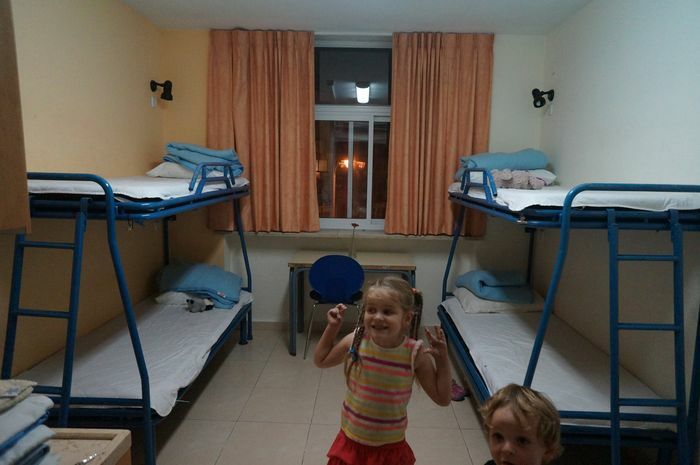 Home » Destinations » Israel » Could Hostels Really be for Families? We have never stayed in a hostel. Not in my time travelling as a solo. Not in my time travelling as a couple. And never with kids. In my mind hostels are roaches and thin mattresses, drunken people making too much noise and shady characters stealing your valuables. Abraham Hostel sure showed me I was wrong. 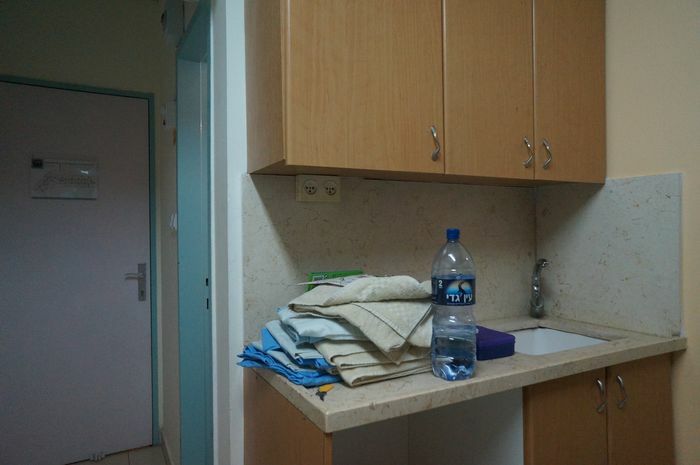 When we were invited by Tourist Israel to Jerusalem and given quarters at Abraham Hostels I was nervous. I wasn’t sure what to expect, but Abraham blew my expectations out of the water. Located on the main street in Jerusalem (Jaffa St), directly in front of a tram stop, in a nondescript building is Abraham Hostel, named after the very first backpacker (and founder of the Jewish, Islamic and Christian faiths) – Abraham. The entrance to the building is pram/wheelchair accessible with a ramp as well as stairs. The door has a buzzer for secure entry. Inside the door the lobby is usually filled with some backpackers. Perhaps a bohemian dreadlocked guy with bare feet and a backpack, or a well-dressed blonde with a suitcase. Any kind and any type. Reception was quick and easy with a map handed out, towels and sheets, the room key and a point in the right direction. We boarded the lift to the second floor and down a hallway filled with brightly coloured quotes to our room at 216. It looked cleaner then I expected. No roaches, clean floors, clean beds, 2 bunks, a shower and sink on one side of the room and a toilet and sink on the other. We made the beds, put away our towels and decided to look around. Up one level on the roof was a chill out area with lovely city views. Down one level, on level 1 was the dining hall (or mess hall) and chill out area, a communal zone if you will. It had a bunk to lounge on, beanbags, and people playing pool or foosball. It also featured a dining area, a piano, a bar, even a movie room and guest kitchen. Breakfast was served here every morning and ranged from cereal & toast to traditional feta and salads. There was usually a bowl of in-season fruit too. All that guests were required to do was wash their plates and cutlery before leaving. The kitchen was an open space for people to use and cook with, as they will, if one wanted to cook something else like eggs or French toast. When people wern’t eating breakfast in this room, they were lounging around, talking together. They were singing at the piano or drinking at the bar. We met so many great people every morning for breakfast, by far an advantage over a regular hotel. I have never experienced the same level of interaction with people as I did each morning in that communal dining area. Not only for breakfasts, but other meal times. On Friday night we attended a communal Shabbat. 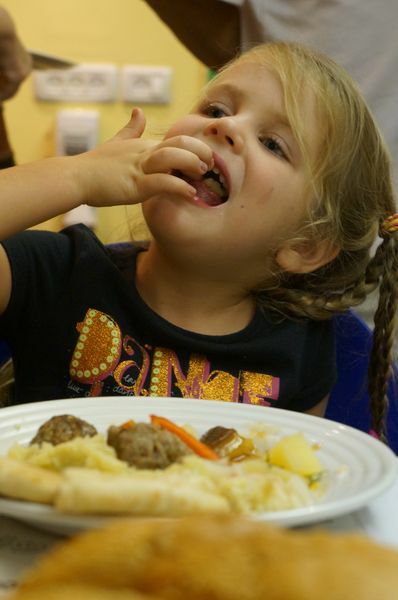 Having done Shabbat dinner in New York with our family we were excited to share it with all others. There must have been over 60 people sharing the meal. 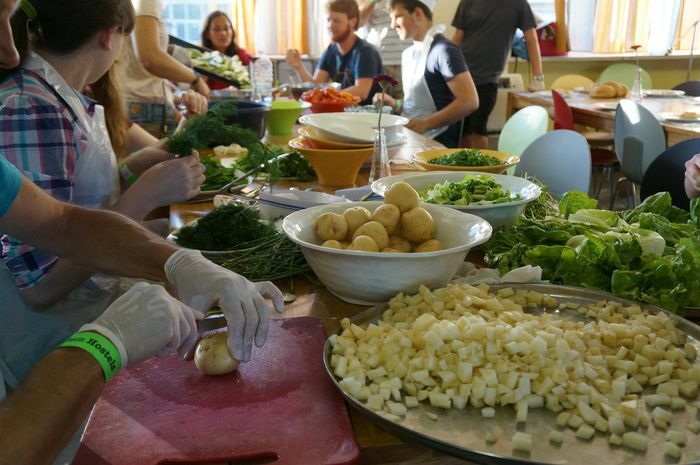 The staff and volunteers (of which you can choose to help) did a wonderful job preparing the meal and for only 35NIS you had an all you can eat Israeli buffet - plenty of hummus and salads, even meatballs. It was a wonderful night, filled with socialization and good food. I can highly recommending doing this as a starting point at the Abraham Hostel (if you arrive on a Friday). We were blown away. How could no one ever tell us hotels could be this way? Why had we resisted so long? As I hear it we weren’t all wrong. The Abraham is very unique, winning several awards for its good nature and fine accommodations. The beds were actually very comfortable and I had a wonderful sleep. I barely heard noise in our little 4-person dorm and everyone was so friendly. We met folks from all the nations of the world – even Australia! If you want to get around the country and see more cool places, there was a convenient tour desk in the lobby area, which helped to arrange a number of different day trips (and multi-day trips) all across Israel. The rates are fairly reasonable, but just ensure you read the brochures to understand what is included in the cost, as some of the sites require additional entry fees to get in. Abraham Tours recently started running a hop-on-hop-off tour bus which does a loop around Israel over a 2 day period. So you’re able to start and get off at a number of stops. This is perfect if you want to see a broad range of great sites fairly quickly or if you’re a more independent traveler and just want to explore each town further and take your time. You'll be able to read our experience in the following posts. The only downer was the wifi speed, which was a little sporadic at times, but I heard that was going through an overhaul while we were there. And we had a bit of a tough time getting hold of our laptop after accidently leaving it on one of the tour buses. That process could have been better handled by the tour desk staff/volunteers. We got more responsive service from them when dealing in person rather than over the phone. We stayed a total of 4 nights at Abraham Hostel and I would do it again. 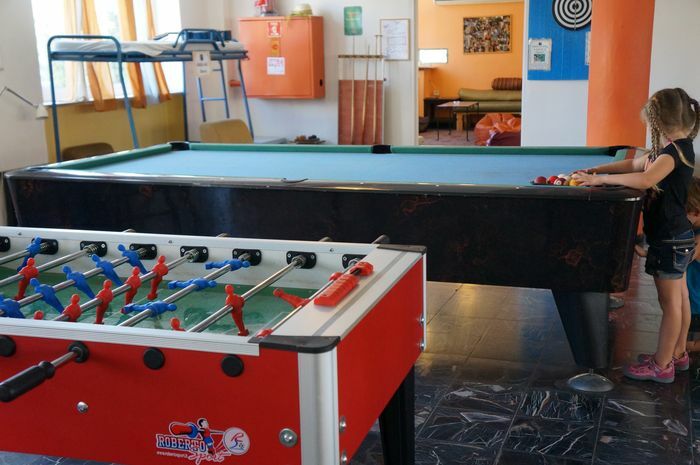 If you have kids and have never stayed in a hostel, then it’s worth a try – you may even be pleasantly surprised like us. Hi! Sounds like a great experience! 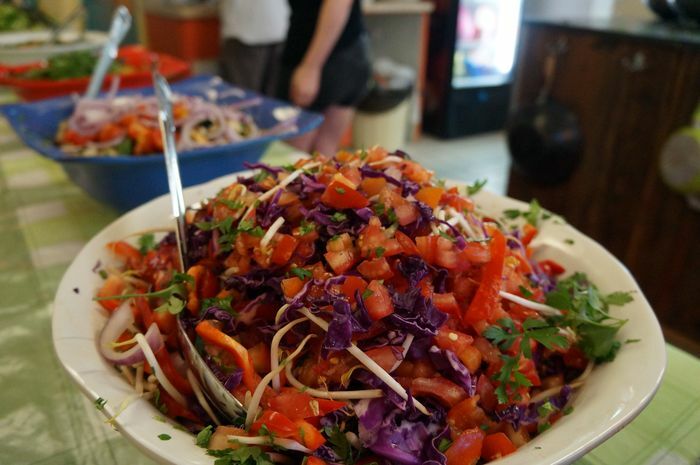 We've stayed in quite a few hostels with and without the kids, it's patchy, some are good, some are bad, but on the whole a cheaper way to go and we're really enjoyed the hostels with the better facilities and decent breakfasts. But, you get what you pay for, the good ones cost. I'd love to go to Israel, hope we get to go! Wow! place looks awesome, especially the rooftop lounge! i never thought id get such a place with just bunks and singles - i try to get a double for me and my 4year old since we just got so used to co-sleeping but i think it could be time for us to be taking in the single beds as well. did you book with them directly? 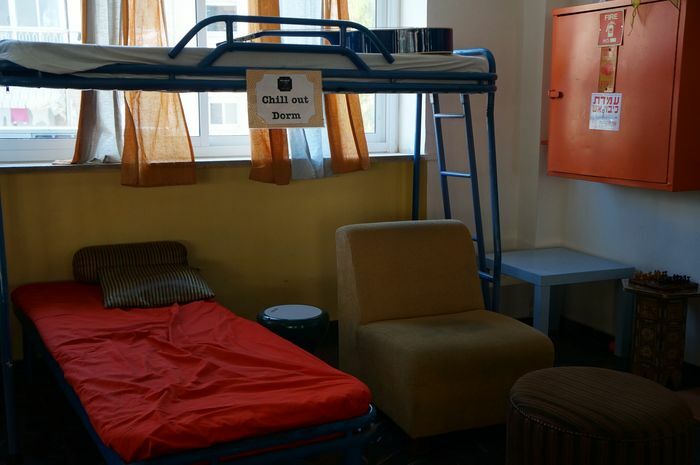 I would never have thought to stay in a hostel with my family. Is there a website listing hostels around the world with travelers' reviews? I would be interested to try staying at a hostel for our next adventure. We have stayed with families before and really enjoyed the experience. Israel is on my list to visit in the near future. Thanks for sharing!